Super flavorful, easy and delicious Blackberry Vanilla Coconut Chai Spiced Overnight Oatmeal! Gluten-free & vegan. 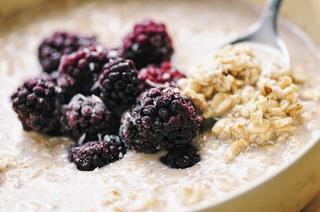 Overnight oatmeal is one the easiest, tastiest, and healthiest breakfasts that can be made! Every once in a while, I manage a combination of ingredients that work so well together, I just have to share--this is one such combination. Combine all of the above ingredients, excluding blackberries, into a jar or bowl. Stir to combine well.Cover & place in the refrigerator overnight.Remove and top with a handful of blackberries & 1 tsp of shredded coconut before serving.Enjoy!